Cesar Manrique had a knack for discovering diamonds in the rough. From seemingly worthless lava caves and overlooked clifftops to functional works of art. Such an illustrious career deserves a grand finale, and that he had through Jardín de Cactus. Sprawled in the sleepy village of Guatiza, it’s a legacy that indeed shows the artist and his purpose. If the origin of the amphitheater-like form of Jardin de Cactus wasn’t revealed, most visitors would assume the land was hollowed out especially for the garden. Quite the contrary, it was, in fact, a former quarry where volcanic sand was sourced. All that was extracted were then spread on farmlands for the soil to retain moisture. It was an empty pit of no use or value to anyone. Not until Cesar Manrique found it, of course, and proved yet once again that art can merge with nature… or, in this case, resurrect it from its blighted state. Together with the botanist Estanislao Gonzales Ferrer, it was given a new life and re-introduced in 1991 as Jardin de Cactus. 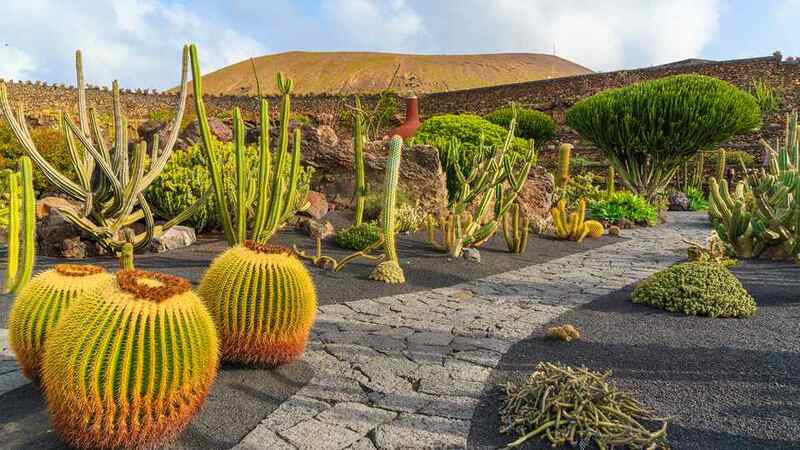 The 5,000 m² botanical oasis has a population of around 4,500 spiky plants. That’s 450 distinct species from 13 different Cactaceae families and five continents. The only way to miss Jardin de Cactus is to drive along Avenida Garafia with eyes closed. Apart from that, it’s legitimately impossible not to notice the giant, eight-meter-high, metallic yet lifelike, roadside cacti and the elevated whitewashed gofio windmill on the way. These two are head-turning landmarks that cause visitors’ expectations to shoot sky-high. There’s no doubt that cactus is the star in this tourist spot. The garden’s wrought iron front gates, door handles, and glass sculpture by the bar’s spiral staircase bear its very image. Of course, it isn’t limited to the inanimate alone as the limelight still goes to the garden itself. Taking the centerstage in this amphitheater-like haven are the spiny spectacles in diverse hues and shapes. On the flat core, they surround natural monoliths and ponds with water lilies and fishes. Whereas, on the terraces, they are lined by the volcanic stone covered walls. Visitors can admire from a reasonable distance, go near for a closer look, or go up the mirador for an entire view of the garden. The last, in particular, affords spectators a contrasting yet dramatic panorama of the dark volcano sandwiched between the clear blue sky above and the gigantic pot of greens below. 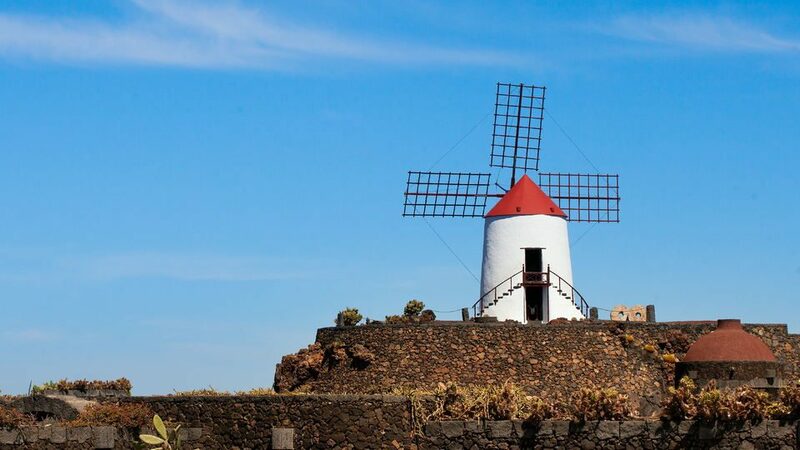 While there, take some time to appreciate the restored gofio windmill. Jardin de Cactus is open from 10:00 AM to 17:45 PM. On summers (July 1 to September 30), though, gates open an hour earlier at 9:00 AM. 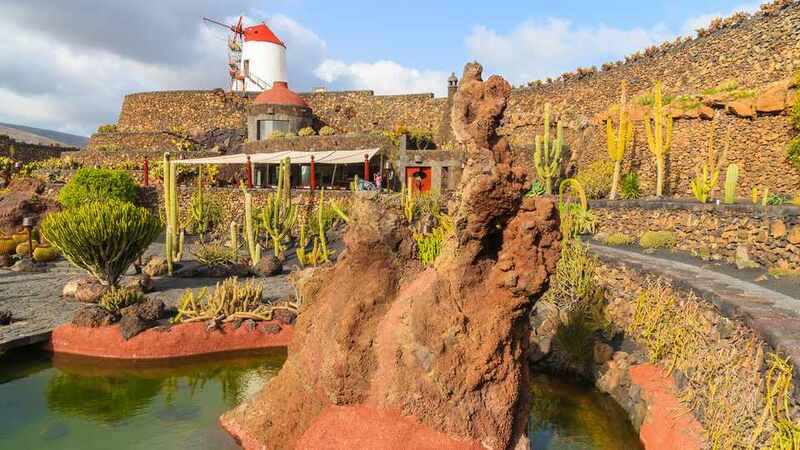 The entrance fees are as follows: €5.80 for adults, €2.90 for children, €4.65 for Canarian adult residents, €2.35 for Canarian child residents, and €1.00 for Lanzarote residents. 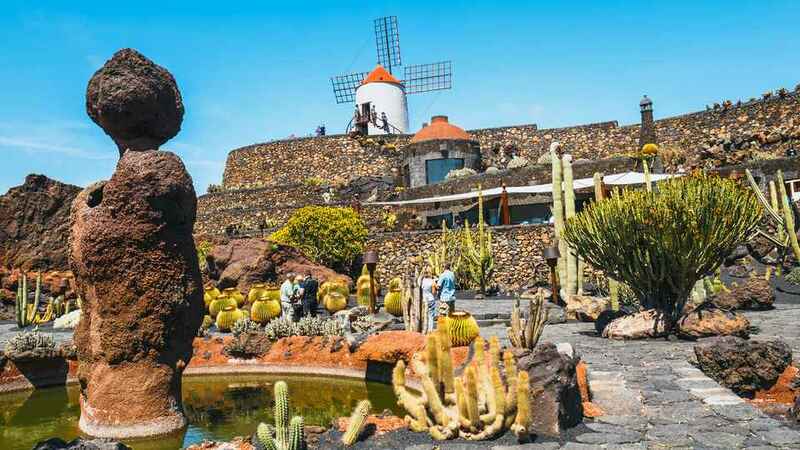 Make the most of your time by combining a visit to Jardin de Cactus with other Cesar Manrique creations Jameos del Agua and Cueva de los Verdes. There are plenty of good buys at the onsite gift shop. The local handicrafts can make great souvenirs. Whereas, the cactus and natural cosmetic products are a must-buy-and-try as they are rare and good for the skin. It’s a place for everyone! Visitors with limited mobility can use the site’s wheelchair on the paved footpaths. Children are very much welcome here too. Toilets have baby changing facilities, and the coffee shop has comfortable high chairs. Pets are strictly not allowed, except for guide dogs. Adore the cacti, but be careful with their thorns. Climb the uneven steps and walk along the terraces with caution. Safety before selfie! 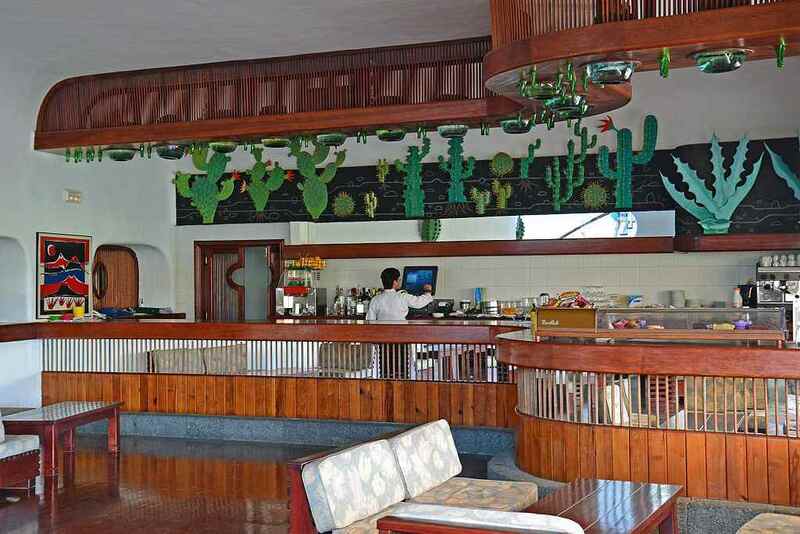 Jardin de Cactus’s cafe bar is worth a try. They have an excellent selection of alcoholic and non-alcoholic drinks that are sure to quench thirst and satisfy. Their menu, although small, has a good number of delicious choices as well. The spicy salted potatoes with mojo sauce, a Canarian classic, is a crowd favorite. While the bread rolls and croissants with local cheeses and cold meats, tuna, and Canarian-style octopus are the runner-ups. The ultimate must-try title, however, can only belong to the cactus burger. Why? Well, because there might not be another chance to try one ever again. From Arrecife, bus numbers 7, 9, and 26 stop at Jardin de Cactus. Note, though, that they have different destinations, so never miss your drop off point. Tourists who will go by car won’t find the drive difficult at all as they only need to stick to LZ-1 all throughout. From the capital Arrecife to Jardin de Cactus, it will only take around 20 to 25 minutes. The giant cactus and white-washed windmill are the landmarks. 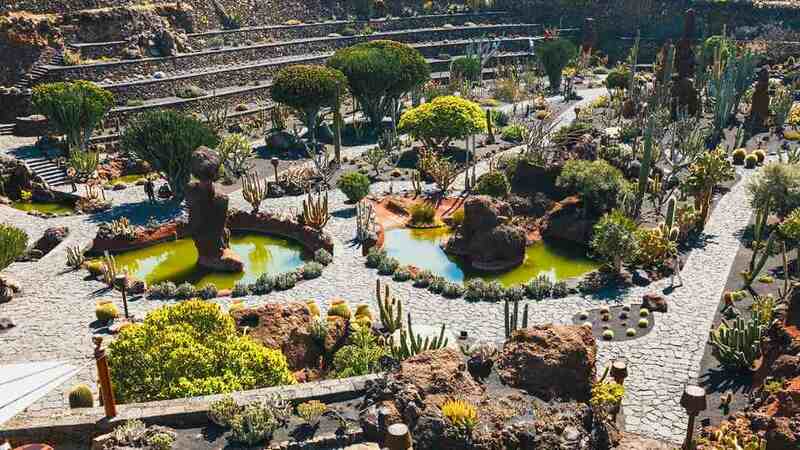 There are hardly any cactus gardens in the entire planet. And, one thing is a guarantee, in this exclusive club, not one is as artfully created as Jardin de Cactus. From a quarry, an ugly hole in nature’s magnificent landscape, to a rare attraction. It’s a coliseum of cacti that also showcases the surrounding beauties. Unique and impressive, it’s a day trip destination that makes a vacation extra special. So when in Lanzarote, go and walk amongst the thorns.